We'd always expected James would love the acoustic section of these gigs so much that they'd extend it. We don't get the fifty / fifty split we'd wagered on, but it's extended tonight to eight instead of six songs, allowing them to add in a couple of songs that haven't been played much in this format and not have to drop some of those they're clearly loving rediscovering and playing. "I've got a broken bone in my foot" Tim explains the crutch that he's walked onto stage holding and he immediately gets the oh-so-funny heckle of "oh Sit Down" from an audience member, which he promptly does for the opening song Coming Home (Part 2). It's noticeable on this track, and throughout, just how much Chloe's vocals are coming to the fore given the space the acoustic set provides, either helping to lift Tim's or to provide a counter to it as a backing vocal and the two complement each other very well. It works equally so when Saul and Andy add their voices to Pressure's On as the single word exhortation to "cry" pierces the air in the hall as Tim remains seated in his new chair "that still has the price tag on it." Tim seems fixated by the fact we're in a sports hall, but later says magic can happen in a sports hall if the right people are there. He then introduces All I'm Saying about a friend of his who died. There's quite a bit of chatter from the back between songs, but the band pause and the lights go down until they shut up, perhaps by that magic he talked about. It feels very tense and taut as the song progresses, a very personal eulogy being played out in front of a couple of thousand people. It's followed by I Wanna Go Home, a new addition to the acoustic set, clearly improvised in parts as it diverts from the structure of the usual electric version. Tim spins round on the chair, repeating the line "in this bar, I am dying" as Saul's violin pierces the air, Mark's accordion makes a welcome appearance to add to the stripped back feel of a song that feels even more poignant here. "We better cheer you up" Tim says deadpan, before questioning whether people change the line of Just Like Fred Astaire to something like "love is just a piece of cheese" instead of "a disease." He changes this in the version they play to some amusement. The crowd, for some of whom this is the first recognisable track, respond by clapping and singing along to one of James' most enduring songs and one that feels perfect for this stripped back set-up. 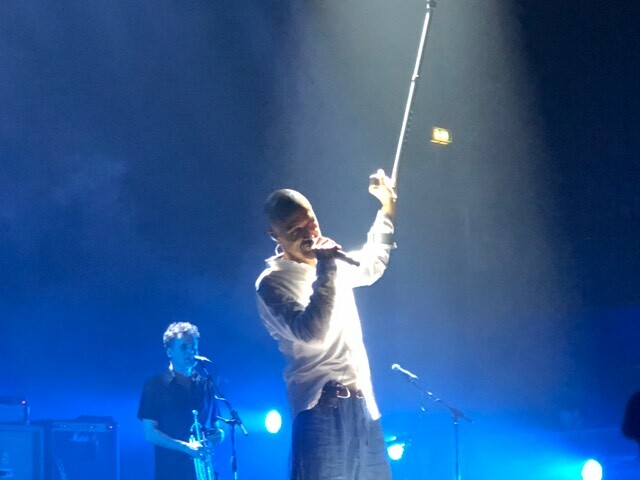 Destiny Calling is another that benefits from the change in approach, not having been played for quite some time because it's a relatively straight-forward song that doesn't quite fit with the ethos of James 2019 if playing as recorded. At the end Tim laughs that the chair makes him look even more like Professor X Man. The semi-improvised nature of these sets has been most evident on Broken By The Hurt, a song Tim tells us they never quite got right while they were recording Living In Extraordinary Times, hence its appearance as a bonus demo track on the deluxe version rather than the standard album. Whether it's Andy's trumpet creating sounds you would never attribute to his instrument were your eyes closed or Tim repeating "up up up" lost in a world of his own soundtracked by his bandmates, it's a million miles away from the popular perception of James, but right at the core of what they do and what makes them tick. 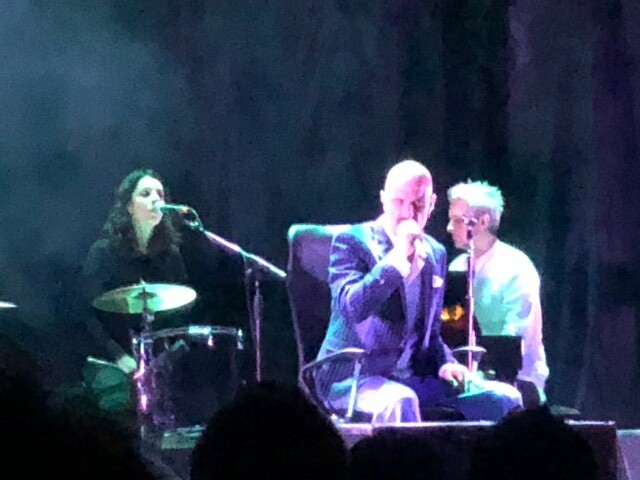 The acoustic set finishes with Hello, the sound team magically creating enough separation off the unforgiving walls of the sports hall to allow us to take in the cello, piano, violin and the subtle lifting backing vocals, making it one of the highlights of the evening. After a short break the band come back for the electric section of the evening's entertainment. 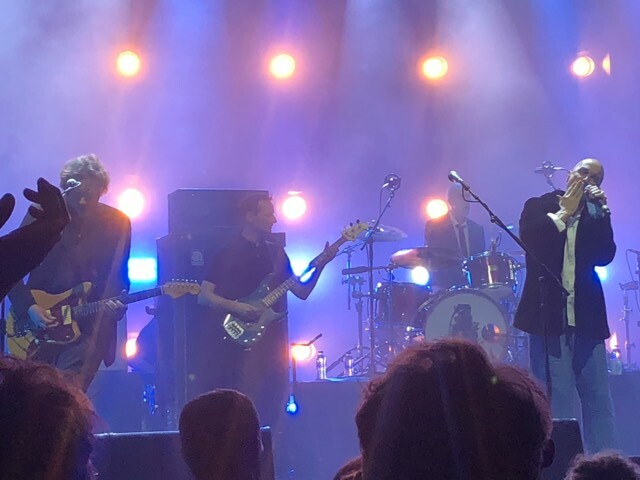 Born Of Frustration opens up proceedings, its first performance on this tour, although it's given away by Saul playing the riff before the rest are ready to start, but as the crowd attempt to mimic Tim's Indian cry with mixed results around us. It's a great choice of opener though as it gets the crowd involved and allows them to then flow into the new songs that follow. Extraordinary Times, with its rumbling guitars and the contemporary feel that U2 wish they could still create, is an impressive introduction to the album it gives its name to's material that forms a major part of the set. Tim's made his way down onto the walkway at the front of the stage on his crutches and decides to set up base camp here for a few songs, which means someone has to pass him the megaphone for What's It All About? and tell him what's being played next. He jokes he feels like Bambi On Ice being restricted by his injured foot, but what it does is create a different type of connection between the band and the audience as he sways around, desperate to let loose as the song makes its winding way through its numerous sections. Moving On has probably been the post-reformation song that has had most impact for James, you sense by looking around the crowd that there are people to whom this song was a huge help in dealing with loss and celebrating life rather than mourning loss. The roar of approval it gets at the end confirms our supposition. The live version of James 2019 feels hell-bent on challenging any perception of them being a hits-churning heritage act and the next three-song salvo provides compelling evidence to back up any waverers on this matter. In the soundcheck Saul described Jam J as post-industrial folk and it's a pretty apt description for a song that has such a sharp-edged metallic bass line that feels like it's warning of an impending apocalypse. Set to a wonderful strobe-lit background and Tim barking the verses through a megaphone, it might be twenty-five years old this year, but you wouldn't know if you weren't aware of their history. It's cut from the same DNA as Heads and Picture Of This Place from Living In Extraordinary Times that follow it. The former is aggressive and belligerent in its approach, spewing venom at the "white American dream" whilst the sports hall is lit up by a wall of brutal white lights, the latter a soaring glorious journey through the band's creative thought spaces with brooding verses and a chorus that just explodes into life and lifts the whole place before heading into a stream of consciousness lyrics about male desire. How Hard The Day shows that there's many sides to James' plan of attack though, a soothing counter to what's just gone before yet uplifting in other more sedate ways. It's followed by a welcome return of I Defeat. 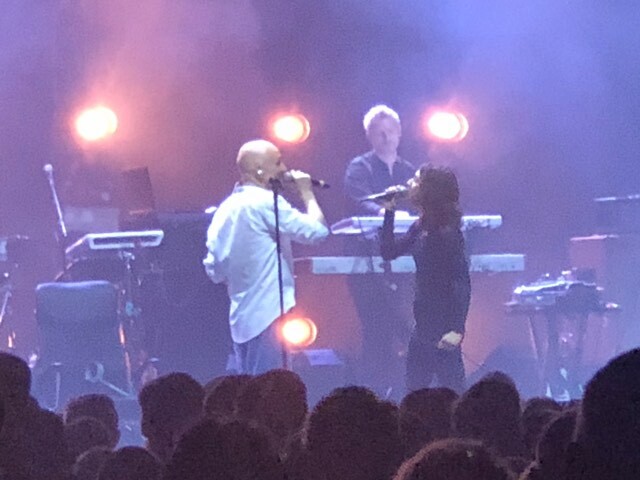 Originally recorded with Sinead O'Connor and with single potential written all over it, it ended up as a b-side, and it's only now with Chloe Alper on board that they can do it justice live and make people aware of it. Tim and Chloe's vocals work perfectly both in unison and in the call and response towards the end. Waltzing Along provides respite for those who are less familiar with James' more recent and obscure material, a song that seems to be getting better with age having been given a significant rest a few years ago. It's classic public perception James, a huge riff running through it and a soaring chorus that's easy to sing along to. "This is a new love song" says Tim, back on the walkway, telling us he feels like it's unsafe if people grab you by the leg given his injury. Leviathan is the stand out track of the new songs, combining their will to experiment with the ability to craft anthems that stick in the head on first listen. It's a glorious celebration of finding love when and where you thought you never would against the odds. Once again, the lighting and sound teams play a blinder when it drops down, Tim whispering in hushed tones to two thousand listeners before the lights and band roll back in like an unexpected tsunami wave. Someone shouts for Getting Away With It and Saul tells them first that it's next on the list, but that if they don't shut up, they won't play it because they're "cantankerous cunts." Tim chides him for using the C word, and says he hoped he wouldn't use and it delays the start of Attention as he says it's flying round in his head. Songs from the last but one James albums usually don't stay in the set but Attention has bucked that trend, clearly a band favourite, the breakdown feeling like it's going to last forever, an odd electronic squeal the only sign that it's going to come back to life for near on a minute. Tim's encouraged by the front rows to dive on in, but he says as a surfer he has to look at the waves and some of the crowd don't want to catch him and some want to throw him to the sharks. They finish the main set with Getting Away With It (All Messed Up), where the crowd threaten to drown out the band, and a rousing Nothing But Love. The encore starts with Come Home, a song that feels reinvigorated this year, Andy and Chloe adding energy to the visuals by prowling the stage, percussion in hand to encourage the audience to join in. When Sit Down, Laid and Sometimes recently made XS Manchester's top 32 songs from the city, Come Home was a surprisingly omission. Saul tells a small section of the audience near him off for booing at the start of Many Faces as it wasn't the song they were expecting, but by the time Tim's waved his crutches around on the walkway to emphasise the message of the song and lowered himself into the crowd to go walkabout, picking out people to dance with, everyone's won over and they take over the song as he makes his way back to the stage. He replies to a cry of "love you" with "love you too, it's all we have" and in these trouble times it feels like music and the messages it conveys is the only antidote. Contrary as they are, they finish with Top Of The World rather than another of the big anthemic singles, but it's a perfect choice as Tim comes down again and is carried all the way back to the sound desk, turned round and taken back on a sea of arms through a wall of phones as Saul's violin takes over providing the soothing soundtrack and a fitting end to a gig that saw James chop and change the setlist to keep things fresh for both themselves and their audience. James played an acoustic set of Coming Home (Part 2), Pressure's On, All I'm Saying, I Wanna Go Home, Just Like Fred Astaire, Destiny Calling, Broken By The Hurt and Hello followed by an electric set of Born Of Frustration, Extraordinary Times, What's It All About?, Moving On, Jam J, Heads, Picture Of This Place, How Hard The Day, I Defeat, Waltzing Along, Leviathan, Attention, Getting Away With It (All Messed Up), Nothing But Love, Come Home, Many Faces and Top Of The World. James' tour continues at Birmingham O2 Academy (21) and Hull Bonus Arena (22) before they play Porto Coliseum (April 3), Lisbon Coliseum (4), Thessaloniki Fix Factory (June 7), Athens Release Festival (8), Isle Of Wight Festival (14), Manchester Heaton Park (15, supporting Courteeners), Eastnor Castle Lakefest (August 11), Edinburgh Princes Gardens Summer Sessions (15), Doncaster Racecourse (17), Hardwick Live (18) and Knebworth Cool Britannia (31).